This is an article in a series or articles, about configuring phpIPAM for automation. If you want to know more about this, you should read the previous articles. 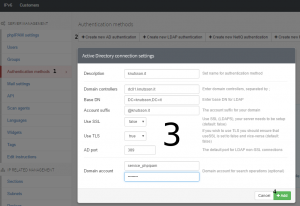 To get Active Directory support in phpIPAM you have to have the ldap php module installed. Run the following command as root. To get SSL/TLS working you need to have phpIPAM trust the certificate your domain controller is using to encrypt your LDAP traffic. Your Ubuntu server will not get your PKI Root servers public key from Active Directory automatically, so we need to add it manually. First you need to get it. If you are using a Microsoft CA server it is most likely located in a share on that server called CertEnroll, otherwise you will most likely find it on any domain joined client. 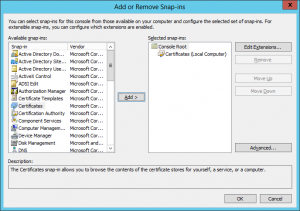 To extract you Root CA certificate from a client do the following. Type MMC and press ENTER. Agree to any UAC prompts. Open the file in notepad or any other editor. Paste the contents into the end of the file /etc/ssl/certs/ca-certificates.crt on your phpIPAM server. 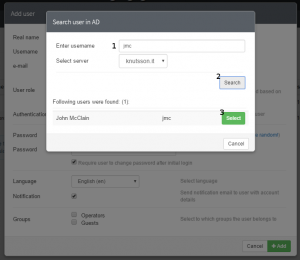 Click Create AD authentication, and fill in the relevant information. If you have not setup a PKI infrastructure and have not deployed SSL certificates to your domain controller and you phpIPAM website, I strongly recommend that you stick to local users, as your login information will not be encrypted. If this is a test environiment with a test domain, you can just deselect TLS. Now it is time to test if you can add a AD user to phpIPAM. Enter an e-mail address. It does not have to exist. If you do not want it to send E-mail, disable Notifications. 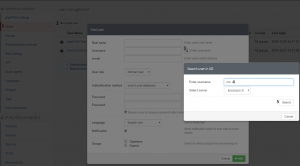 In order to use E-mail notifications, you will have to setup E-mail under Mail Settings. As this is very easy I will not be going through it at this point. If you enable notifications, and have not setup mail, you will get an error. Now logout and check if you can login with the added user. I’ve configure AD authentication but it seems to accept any password if login matches AD login. Huh. I have not had that issue. Could you post a screenshot of you AD config somewhere?